In England, sample takers must complete a 3-yearly update for cervical screening training. With health professionals working in different locations, with busy schedules – to regularly coordinate this as face-to-face training can often prove difficult and costly. NHS England London initially approached Onclick for an online cervical screening update solution that their sample takers could choose take online and purchase independently (via desktop or tablet device). By developing a generic version of this course material, we looked to expand the reach of this resource across the whole of England. To ensure we found an appropriate subject expert to develop content with and alert us to changes within the industry, we decided to partner up with the London Regional Cytology Training Centre, who provide high quality whole pathway cancer screening training for healthcare professionals in London and the South East. NHS England London were also involved at key stages to check course materials and ensure it complied with their own learning objectives. We also ran testing with a selection of sample takers for user feedback and suggestions along the way. From a design point of view, we decided to take a fresh spin on this sensitive subject and create a contemporary, fun and interactive course, inspired by classic styles of a typical woman’s fashion magazine. 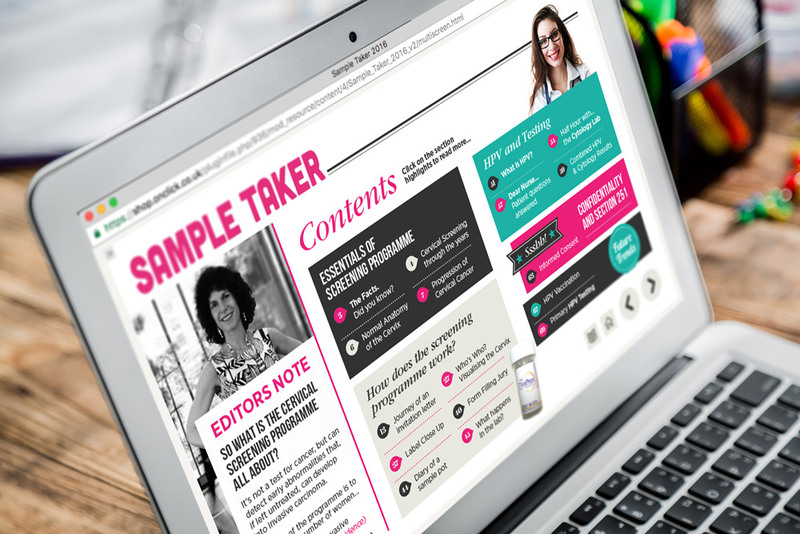 The design integrates informative content within the familiar layouts of exclusive interviews, diary timelines, problem pages, recipes and puzzles. Whilst providing top tips and advice on the consultation process itself, the course aims to provide a clear understanding of all cervical cancer types, HPV testing, cytology results and future trends within the industry. This course is hosted on our Onclick Shop and available to Sample Takers via PayPal for £25 + VAT. This allows the user a year’s access to all course materials, offers an online assessment and downloadable certificate of completion. To further promote the cervical screening update training, we developed a short animated video to be used at exhibitions. 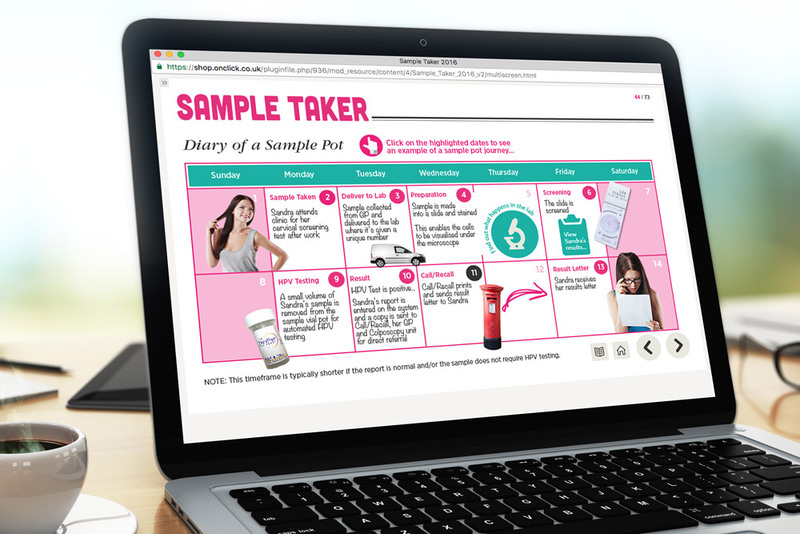 We have had a high uptake of sample takers in London using the service, with fantastic feedback from users. There has also been a great interest from other regions in England, some who are accessing the materials via the Onclick Shop, and some who have developed their own platform with us to host unique content alongside the elearning. We regularly meet with London Regional Cytology Training Centre to review content and issue new versions of the course to reflect changes in the industry. It’s visually fun! A strong use of iconography, illustration and photography. Uses visual navigational clues. Iconic prompts support ‘click’ instruction. A great variety of content, that takes a reportage approach to the subject. Every page is in the magazine style including the help page. It has a good range of screen features and creative interactions. This course is clearly aimed at a particular demographic but it’s very well put together. DO LIKE WHAT YOU’VE SEEN?